Representatives of liberal forces swept the leading positions of the Committee of 50 during internal elections on Sunday, ending the day with a resounding majority in the newly-formed committee tasked with writing the final draft of Egypt's post-30 June constitution. Amr Moussa, a former presidential candidate and past secretary-general of the Arab League, was elected committee chairman with 30 votes. His rival, lawyers syndicate chairman Sameh Ashour, got 16 votes. Two votes were considered invalid. According to Mohamed Salmawy, the committee member in charge of counting the votes, 48 members out of a total 50 attended the session. Absent were El-Sayed Mohamedein, chairman of Suez Canal University, and Bassam Al-Zarqa, deputy chairman of the ultraconservative Islamist Salafist Nour party. Mohamedein is currently outside Egypt, whereas Al-Zarqa is expected to attend tomorrow's session following a last-minute Nour party vote in favor of participating in the committee. Moussa promised to do his best "to help Egypt draft a constitution that reflects the ideals of the two revolutions of January 2011 and June 2013." Moussa's three deputies, who were also elected Sunday, also represent a liberal to moderate perspective. They include world-renowned heart surgeon Magdi Yacoub, human rights activist Mona Zulficar, and Islamist thinker Kamal El-Helbawy. Speaking to parliamentary correspondents on Saturday, El-Helbawy, who describes himself as a liberal Islamic thinker who rebelled against the Muslim Brotherhood's ideology, stated that he is "against mixing religion with politics." "My message to Islamists – after one year of rule by a very bad regime – is to keep away from politics in order to allow this country to move forward," El-Helbawy added. Meanwhile, Gaber Nassar, president of Cairo University and a high-profile constitutional law professor, was elected as the committee's rapporteur. Like Moussa, Nassar boycotted the Islamist-dominated constituent assembly which drafted Egypt's 2012 constitution under former president Mohamed Morsi. Mohamed Salmawy, a liberal dramatist and chairman of the Union of Egyptian Writers, was elected as the committee's media spokesperson. The committee's procedural meeting was headed by Abdel-Gelil Mostafa, the liberal-oriented chairman of the National Association of Change. 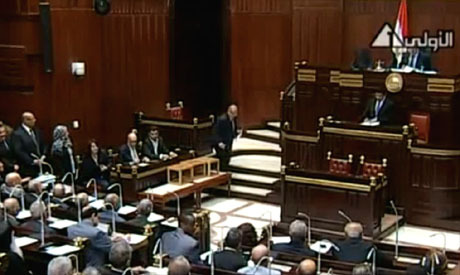 Moussa emphasised that committee's main job is to draft an entirely new constitution, rather than simply revise amendments to the 2012 constitution. "We obtained an initial draft constitution from a 10-member technical committee and we will take it as a new constitution, rather than as an amended version of 2012's national charter," Moussa stated. In his opening words, Moussa expressed optimism that "the new constitution will reflect the people's aspirations for real democracy, political pluralism, and an effective separation of powers." Moussa also elaborated on the slogan of Egypt's "two revolutions" – which he deemed "bread, freedom, and human dignity." "By bread we mean comprehensive development. By freedom we mean functioning democracy. By human dignity we mean respect for human rights," he said. Moussa asserted that the 'Basic Freedoms Document' issued by Al-Azhar last year, which "stresses the principles of freedom of religion and speech, in addition to Egypt's enlightenment role in the region," must be taken into account when drafting the new constitution. Bishop Paula, the Coptic Church's representative, argued that "the election of a woman, a Christian and an Islamist thinker as Moussa's three deputies sends a very important message to Egyptians and to the outside world that Egypt is moving in the right direction and that there is no room for excluding forces from the political scene." Nasser and Zulficar said they have drafted internal bylaws to govern the committee's performance. Members differed over whether or not the committee's meetings should be aired live. Salmawy objected, whereas doctors syndicate chairman Khairy Abdel-Dayem, who is viewed as sympathetic to the Muslim Brotherhood, argued that the meetings should be televised so as to give Egyptians "firsthand coverage of the committee's performance." Because the committee has only two months to finalise the draft constitution, Moussa told committee members that "intensive meetings" will be held to ensure completion. Moussa also proposed bi-weekly meetings of the entire committee to review debates within sub-committees, which will meet on an almost daily basis. During a press conference following the inaugural session, Moussa said that the committee's bylaws had been finalised and will be voted on during Monday's meeting. "What matters is that we reach a constitution that fulfills the ambitions of the Egyptian people," Moussa added, asserting that the sixty-day limit will be sufficient to complete this task. Ali Awad, head of the 10-member technical committee which produced the constitution's initial draft after one month of deliberations, said that the 10-member committee will assume an advisory role in the second stage of constitution-drafting, but it will not have voting powers. What a joke,liberals isnt holding 100% membership of the this committee or assembly selected by Army & Judciary...? Now they will make a new constitution in 60 days after eleminating Islamic leaning political figures from the process.Last constituent assembly was not representative because liberals were holding 40% memerbship as compare to 60% Islamist and constitution was passed in 6 months in haste.Now making a new constitution in 60 days eliminating representative of 70% egyptian.....what a road map...what a liberal hypocray sorry liberal democracy. There is no exklusion of political forces in Egypt.Does the Christian bishop really believe in his own lie?The constitution should reflect the two revolutions:There was a revolution in 2011,but there was only a military coup in 2013.That is the truth,even when al-Ahram will Not publish it! An obscene, anti-Islam and anti-democratic constitution. It represents no one. what if 90% of Egyptians said NO to this undemocratic, unrepresentative and anti-Islam constitution? This is a sad day for democracy in Egypt. If I were Egyptian, I would every thing in my power to destroy this obscene constitution. Hamdulillah - you are not Egyptian... What means anti-Islam, by the way???? I think 45 of the50 members are Moslims as you are. Or do you have the only truth and wisdom what Islam or a good Moslim are? But the question remains: who elected them? Israel? the Coptic Church? The CIA? The Mason lodges? The Islamists, at the very least, were elected by the masses.